Ever wonder why people choose to make their own Marinara sauce rather than take the easy way and buy it off the grocery store shelf? I have to confess, that until last week, I had never made homemade marinara sauce; something Linda makes at least twice a month. Well, now I know why she makes her own. It’s easy peasy and it tastes so much better than store bought Marinara sauce. This week we are posting the Two Friends Basic Fresh Tuscany Style Marinara Sauce recipe: http://twofriendsinakitchen.com/recipe/fresh-tomato-sauce-tuscany-style. With a little twist, you can turn it in to another type of red sauce (see tips below). The fun thing about this recipe, is that you get to go to the farmer’s market and take the overripe tomatoes off their hands. I live in Oakland and we have a huge farmer’s market that is just buzzing with energy every Saturday in the Montclair Shopping Center! So on a Saturday morning a few weeks ago, for the very first time, I went to the Farmer’s Market shopping for the best overripe tomatoes to make Marinara sauce. I was going to make a big batch of sauce so I’d have lots to freeze. To do this, I needed 20 pounds of very ripe tomatoes – yes that’s right, 20 pounds! Since I have never purchased 20 pounds of ripe tomatoes, I really didn’t know what to expect. I went to the first vendor and asked if she had any tomatoes perfect for sauce making. She didn’t have any. I scouted out another vendor and asked if she had any. Her enthusiastic response was “I sure do!” She directed me to a bin to sort through. I chose heirlooms, red, yellow, orange, purplish, round, oblong, big and very small tomatoes for my batch of sauce. Honestly, I’d never seen so many varieties in one place, ready for the picking. 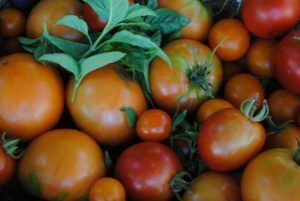 I got the bargain of the day – 20 pounds of great, organic tomatoes for $1.00 a pound! She was happy. I was happy. After spending a couple of hours at the farmer’s market trying their many samples, I headed home to make my sauce. I followed the Two Friends recipe and soon (I mean very soon) had a great marinara for dinner AND I had lots of jars for the freezer. I call that a win, win! Some times depending on your tomatoes, the sauce might be a little watery. If it is, just let it simmer 20 minutes or so longer without a lid so it thickens. Once you are satisfied with the consistency, remove it from the stove and let it cool. Once it’s cooled put it in glass jars or plastic containers (remember to leave a little room at the top for expansion) and place them in the freezer if you are freezing for later use. The frozen sauce will last in the freezer for up to six months. Don’t forget to save a little sauce for tonight’s dinner! Another option is to use your yummy fresh Marinara in place of canned tomatoes. You can use it in place of canned tomatoes to make your favorite red sauce, meat sauce, Bolognese, or as your pizza sauce. If you love Italian cooking, (and who doesn’t), check out our website store and purchase La Cucina Marinello, the Italian cookbook that Linda and her two sisters wrote.It’s much more than a cookbook; it’s also the story of growing up Italian in southern California. The cookbook is filled with fantastic Italian dishes and pasta, pizza, salad, soup, chicken, fish, and meat recipes that everybody will enjoy. This entry was posted in Blog by Linda Carman. Bookmark the permalink.